I agreed to this life — living overseas, church planting, and raising my kids in a foreign land. It has certainly come with a few surprises and plenty of challenges. While sometimes it may not be all I expected or dreamed it would be, it is what I wanted. When the reality of what this all really means hits me in the most disheartening ways, I have to remember that. I have to remember why I started if I want to keep moving forward. I have to remember why I started if I want to keep moving forward. I agreed to serve Jesus because He gave His all for me, and I am compelled to do all I can to magnify His great love. I agreed to work alongside my husband as we cross-cultures to share Christ because I trust him completely and believe in him wholeheartedly. I agreed to learn a language and culture because there are millions of people that haven’t heard the Gospel in their heart language, and I may have the opportunity to change that — even if only for a few. I agreed to raise my children away from the comforts of our home and our family because Jesus is worthy, and I want them to know that more than any other lesson I could teach them. Jesus is worthy. Because of that I will agree to keep serving Him every day He gives me, trusting one day that the impact of that decision will far exceed my expectations. Jesus is worthy. Because of that I will agree to keep serving Him every day. Earlier this week, I ran out of money after helping a friend out at the airport. Unfortunately, taxi drivers in Kathmandu don’t take Visa. I had a taxi take me from the airport to my husband’s office at the church, so he could bail me out of my predicament. He willingly obliged and didn’t seem terribly put off by me hanging around for the afternoon. He and ‘his guys’ (men training in ministry) spun a bizarre story about something I needed to see in the back room. One of them even took a video as I stretched out one leg to open the door and kept my eyes half-shut. I almost believed their story of a caged rat the size of a dog, and I wasn’t sure what I was going to see in there. Instead of a scary beast, I saw a great gift my husband had been hiding away for me. They had been working on remodeling my Sunday school “room” which wasn’t really a room at all but was more like a giant storage space with all kinds of things little ones should not get into. Tears welled up in my eyes because I’m an emotional lady these days and because I was just so relieved. We aren’t big on romantic gestures and gifts on holidays, but this made me know I had been heard by my husband and he cares about my needs as I labor with him in ministry. I said to him, “You know this won’t make me a better Sunday school teacher.” In a snap, my insecurities crept in to steal the goodness from this moment. I am not a natural-born teacher. I’m not even really great with kids outside of my own family. It is a challenge for me every week to get up there and teach — and in my second language, no less. But my insecurities are not and cannot be an excuse to not do my best. Even if I think my best may not be good enough, my best can meet these kids where they are with hugs and candy, names-remembered and simple-truths taught. I may not create killer lessons that others would copy, but I can create opportunities to influence little lives. I can spur smiles and laughs and teaching moments — even if I’m not the best teacher. My other excuse, my lame Sunday school room is history. May my enduring excuse of insecurity finally be history, too. My insecurities cannot be an excuse to not do my best. And…here’s some pictures of “my babies.” I really do love these kids. We are 6 months into a church plant. 6 months of planting, sowing, praying, and planning. I’ve watched my husband work harder than anyone I’ve ever seen with a passion I’ve never seen paralleled — of course, I am a bit biased on that matter. God has placed a big dream in our hearts to see a gospel movement in this country. At times, we have been discouraged because we have found the work to be slow going just as language learning proved to be. We trust God knows what He is doing, and His timing is perfect, but big dreams leave us wanting. God has been teaching me that minimal is still movement and painstaking is still progress. If we glimpse to see it, there is evidence of God’s passionate pursuit of our people. Not only that — I have also discovered God’s heart for the lost. He desires that all men be saved. Each and every one. He tells us in His word that He rejoices with each repentant heart that passes from death to life. And so should we. If every convert takes 6 months or more, they are worthy of every effort expended because He is worthy to receive them into His fold. And he is looking for them, calling them to Himself. So I choose to celebrate small in what we’ve seen in 6 months — one soul trust Christ. Praise be to God! I say unto you, that likewise joy shall be in heaven over one sinner that repenteth, more than over ninety and nine just persons, which need no repentance (Luke 15:7). There is joy in the presence of the angels of God over one sinner that repenteth (Luke 15:10 b). God has been teaching me that minimal is still movement and painstaking is still progress. What have you discovered about God’s heart for the lost? Nosy neighbors. We’ve all had ’em. We had an especially nosy neighbor in the first colony we lived in here in Kathmandu. I would see her in the morning and she would say, “I saw you had pizza for dinner last night. How was that?” Her roof, where she did laundry and bathed, looked right into our dining room. We learned to shut our curtains at dinner time or we would have an audience. I’m sure it was pretty entertaining with my picky eater toddler and throw-everything baby and the two of us trying to converse in our second language with our tutor over a plate of American food he was trying to get down with a smile. What I have learned after experiencing several of these types of situations is this — Neighbors don’t have to be nosy if you share your life with them. Sit with them. Drink tea/coffee with them. Talk about kids and school and work and life. Inviting them to church or sharing the gospel should not come out of the clear blue; it can ‐ and should! ‐ be a natural outflow of life lived in close proximity. In this close proximity, if our friends and neighbors are not hearing about Jesus and being invited into our relationship with Him, a heart examination may be in order. Our love for Jesus should be clear and contagious to those we spend our time with. Neighbors don’t have to be nosy if you share your life with them. When the Taube family shares our life, we don’t have to be “the foreigner TV” show anymore. They’re learning plenty from our regular interactions, and we are enjoying our peace and privacy in our home. 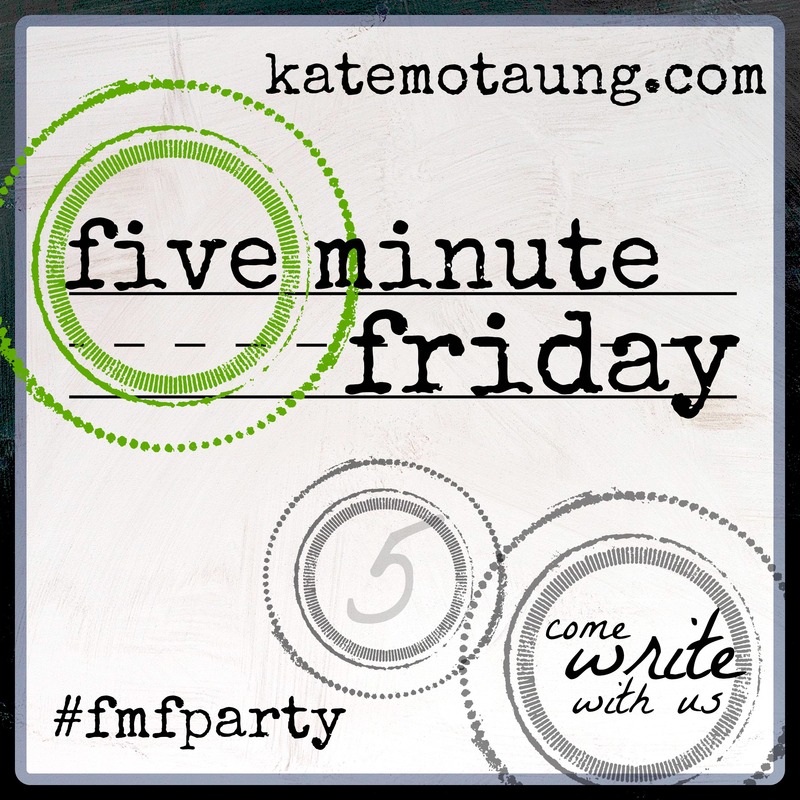 For more information about the Five Minute Friday community, Click Here.